It is a wonderful story, how His Divine Grace A.C. Bhaktivedanta Swami Prabhupada came to the United States in 1965 and established the Hare Krishna Movement in the Western world. Of course there are many books by disciples of Srila Prabhupada describing this time but there is one very special book, “The Hare Krishna Explosion” by Hayagriva dasa which stands supreme above all the other books describing this amazing achievement of Srila Prabhupada. The Hare Krishna Explosion only deals with the four year period between 1966 and 1969 and it is the only book describing these amazing pastimes of Srlla Prabhupada which was actually written at the time. Hayagriva Prabhu wrote the first draft of the Hare Krishna Explosion in July 1969, just after Srila Prabhupada’s first visit to New Vrindavan. This is my favorite book which describing how Srila Prabhupada took the Krishna Consciousness Movement to the West and I was very sad that it has been out of print now for many, many years. It is a very important historical book that contains dozens of black and white photographs from the time and it is simply a wonderful, ecstatic read. You will be transported back to the 1960s and will be able to personally experience the mood and feelings of the time and you will see the amazingly personal and loving way in which Srila Prabhupada deals with his disciples. 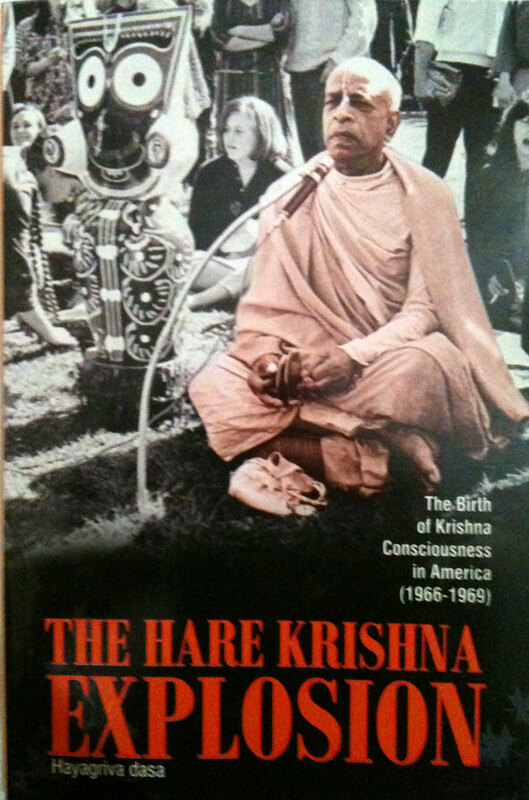 Anyhow I really recommend that you read this book and guarantee it will inspire you in Krishna consciousness…. “What are the symptoms of one whose consciousness is merged in transcendence? How does he speak and what is his language? How does he sit and how does he walk? Prabhupada’s real identity defied analysis. I was surprised to learn that he had once been a pharmacist with a wife and children. Because worldly motives and passion never touched him, it was difficult to imagine him as a householder, as anything but the saffron-clad spiritual master, the paramahamsa floating over the world like a swan over water. Since we were all drowning few of us asked these questions, we grabbed the rope any way we could, assured of some ultimate victory in Vaikuntha, a faraway spiritual universe. And whenever there is Srila Prabhupada there will certainly be Lord Krishna. I first see him just after crossing the Bowery at Houston Street. As he passes before the iron-mesh fence of a playground, I distinctly glimpse the aura of saintliness. I watch him through the rushing traffic and stumbling derelicts. He strolls almost jauntily down the sidewalk. He is an old man whom age has never touched. Aloof from the people and bustle about him, he walks proudly, independently, his hand in a cloth bead-bag. He wears the saffron robes of a sannyasi, and on his feet are quaint, pointed white shoes. Only seven months ago I had seen many saffron-robed monks and holy men walking the dirt roads of Haridwar and Hrishikesh, and stopping beside the Ganges to bathe. For me that had been a futile journey to the mystic East in search of the all-knowing guru. But now what’s this? I look again at the pointed white shoes. Did this man follow me all the way from North India? Or did he just suddenly descend from the clouds onto Manhattan sidewalks? I decide I must speak to him. As I start across the street, trucks rumbling towards Holland Tunnel block him from my view. I look again to make sure that he is still there. Yes, he even appears to be aware of me. He has all the bearing of a great actor in a famous movie. I can’t think of what to say, but I approach him anyway. We both stop at once. His sudden smile is moonlight in the grey July smog. “Are you from India?” I ask stupidly. “Oh yes,” he says, his eyes bright and expressive. Crosstown buses roar past, billowing exhaust like clouds of incense. I sense that his tranquility is fixed in something beyond the traffic roar. “And you?” he asks. A poor excuse, but I can think of nothing else. His large brown eyes sparkle. How old is he? His head is shaved, save for a few white hairs in back, and his complexion, golden Bengali, seems radiant against saffron robes. His presence evokes quiet ashrams nestled near the Himalayas, cows, bells, temples and holy rivers. “You are living near here?” he asks. “Of course,” I say, and we turn and walk the half block to Second Avenue. We stop before a small storefront between First and Second Streets, next door to a Mobil filling station, and across the street from the Red Star Bar and Gonzalez Funeral Home. Occupying half the ground floor of a four-story apartment building, the storefront had evidently served as a curio shop, for the words “Matchless Gifts” were painted over the front door. “This is a good area?” he asks. “Oh yes,” I say. “It surely is.” Suddenly I feel sorry for the grandfatherly gentlemen so far from home, so helpless in such an alien metropolis. “I would like to hear your lectures,” I say. “Then you must come,” he says. Another moonlight smile. 5 Responses to The Hare Krishna Explosion! I am one of the symphatizers of khrisna devotees and still try to practice what have been instructed by lord himself .i do hope to succeed in mission of life through devotional service of the lord and get the full mercy from his divine grace srila prabhupada and all pure devotees in disciplic succession. Hare khrisna! i am conscious now.. i am krishna conscious.. i have surrendered ..chanting maha mantra gives me peace, and i can feel i am going away from the miseries of my life..everybody should practice it..everybody should know the absolute truth.. i am just about to finish reading Gita ji and i would like to help in any way so that more and more people can become krishna conscious and realize the superior energy of THE SUPEREME. Yes. We need a bona fide spiritual master to make any advancement in Krishna consciousness and most of the people currently advertising themselves as spiritual masters are imposters. And it is a great disaster if one accepts an imposter as his spiritual master. So my suggestion is that Srila Prabhupada is still with us, he continues to live in his transcendental books and his recorded lectures and the film and video recordings we have of him. So Srila Prabhupada is a pure devotee of Krishna and the most perfect spiritual master, and he is with us, all we have to do to get his personal association is to pick up his books and read them. So please make a program to read all of Srila Prabhupada’s books and put the instructions that you will find Srila Prabhupada giving you as you read into practice in your life and you will have the perfect spiritual master and will be able to make very rapid advancement in Krishna consciousness. Thank you for your all inspiring emails that you send me. Unfortunately I should inform you that i can not buy anything from Internet , because of our situation in my country . So I am very happy to hear about all these news in Krisna consciousness and your services also, and I think that my situation is also krisna’s mercy and I should Learn sth . Thank you again . Your emails are my hopes , when I open the page I just wonder if there’s any of them.